The explosive conclusion to the New York Times bestselling trilogy that began with Infected and Contagious. The alien intelligence that unleashed two horrific assaults on humanity has been destroyed. But before it was brought down in flames, it launched one last payload-a tiny soda-can-sized canister filled with germs engineered to wreak new forms of havoc on the human race. That harmless-looking canister has languished under thousands of feet of water for years, undisturbed and impotent...until now. Days after the new disease is unleashed, a quarter of the human race is infected. Entire countries have fallen. And our planet's fate now rests on a small group of unlikely heroes, racing to find a cure before the enemies surrounding them can close in. I've been a Sigler fan for years. Ever since the day I picked up Infected, in fact. This is the third and final book in the Infected series, so I knew without a doubt I had to read it. I was anxious! The very day I received it I grabbed it tightly and ran off with glee to find a quiet little corner to devour it in. I was in for a surprise though. I didn't like it. It was dry and felt far away. I was disappointed. I waited a week and picked it up again. I still had that same feeling. As if someone was telling a story on the other side of the country and I could make it out if I focused hard enough, but wasn't sure it was worth the effort. So once again, I put it down with dismay. Where was my Sigler? Where was that writing that made my flesh crawl and made me drop my jaw in awe at the working's of Sigler's brain? What had happened to one of my favorite sci-fi series? Where had my Sigler gone? I felt disappointed and let-down. I wanted to scream with frustration. So, I waited another week and gave it another shot, determined to find the writing and storytelling that I love so dearly. This time, I met with success. I had to plow through several chapters to get to that feeling I craved though. However, when it picked up, it really picked up! Characters from previous books had a new glow to them. New characters jumped right into my soul for eternity. The dark and twisted side of Sigler was back! The side where anything can happen and just when you think you have a handle on things, you're sideswiped with a train riding a surfboard! Not literally, of course, but that's what it feels like. Everything that shouldn't happen, does. Everything that goes against all reason of humanity is there, laid out for us like a fourteen course meal. Sigler's genius shines brighter in this book than any other. It was the perfect ending to the Infected series. If you want a series that will creep the bejeepers out of you, seriously, I can't suggest this one enough. However, start with Infected, and then Contagious and move straight into Pandemic. I think a lot of my issue in the beginning is that it's been years since I read the others and I didn't keep up the momentum. If you've already read the first two, go back and reread them again and then jump straight into Pandemic. Rereading them is a worthwhile use of time, anyway! 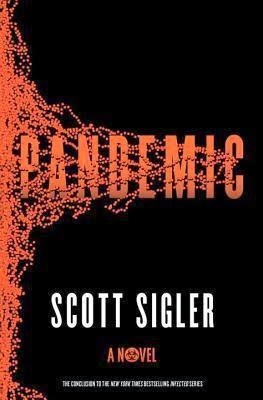 Pandemic can be read as a stand alone, but I don't suggest it. Though you can easily get a feel for everything going on, by reading the first two, you get the full effect of Sigler's layered writing.